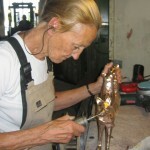 Tineke Thielemans is a self-made artist. Her natural feeling for dimensions and space, combined with her imaginative spirit made that sculpting went automatically for her. From the first moment she simply knew how it worked. She followed courses to acquire the different techniques and skills which the art of sculpture requires. Inspiration comes from within herself. She does not want to be influenced by trends, styles and different periods in art, but just by looking and listening to the worlds around her. She feels an affinity to artist like Jeroen Bosch, René Margritte and Salvador Dali. The alienated aspects in their works; the surreal characters appeal to her and this alienation is to be found in her own sculptures. She works with punctual accuracy, not from a fixed image or a series of detailed drawings, but from her own thoughts, thoughts which come from observations from the world around her. Thoughts which run freely when at work and which become visible in the deep layers in her sculptures. Nowhere is her work too direct or one-dimensional in content and her sculptures create a whole life of new images and associations with the viewer. She explains her love and fascination for the animal world by showing the mystic, playful and natural character of animals. To show the human proportions, the social, cultural and political phenomenon she often uses figures and symbols of the animal world. Animal figures, which often have been attributed human characteristics and features and elicit a smile from the viewer, but also incite to reflection. This makes her work alternately humorous, touching and confronting.